A statement like that brings to mind bad jokes, somewhat-cute-but-slowly-growing-out-of-it preadolescent boys, and loads and loads of marching. Of course, the more enlightened amongst us would scoff at such stereotypes, and as Raffles Press found out, the Boys’ Brigade is far more than that. In our latest interview feature, we spoke to Josiah Tan Yi Teng and Ang Zheng Shun, who were recently conferred the Boys’ Brigade President Award, the highest achievement one can attain as a member of the Boys Brigade. They tell us about their passion for BB, their choice to continue in the BB as a CCA, and even their thoughts on the strict drills that are characteristic of Uniform Groups. 1) Could you share your thoughts on winning the Boys’ Brigade President’s Award? J: Personally, attaining this award is a form of affirmation that I have achieved the rigorous standards demanded by the application process. The level of service demanded by the Primer’s Program requires a certain level of competency, and I found myself growing exponentially, in terms of my capacity to lead, organize and manage events and manpower. Beyond that, my time as a Primer was also a time of tremendous growth in my spiritual life. I got to meet many amazing people such as my Captain, Mr John Samuel, who inspired me with their passion for God and dedication to service. These spiritual giants helped me to mature as a Christian and inspired me to deepen my relationship with God. Z: It really means a lot to me personally. Apart from the fact that it is a form of recognition for myself, it is also dedicated to all the people whom have played an integral role in my growing years – my parents, officers, teachers, old boys and batch mates. They have given me a lot of support and encouragement throughout my years in RIBB and I am really grateful for them. Attaining the award does not mark the end of my journey in BB. It marks a new beginning. It is a form of motivation for me to continue serving the BB in greater capacity, and at the same time inspire more Boys to join the BB and continue in Year 5 & 6. 2) What motivated you to join, and remain a member of, the BB? J: The Boys Brigade Primers Programme is based on the themes of service and leadership. As a Primer, I serve my company (at the Y1-4 side). I was motivated to return to the company as a Primer as I believe that fundamentally, the Boys Brigade is about investing in lives. I view my service in the Boys Brigade as an area of ministry, one which I am uniquely placed to excel in. Looking back at my years as a Boy, I can’t help but give thanks for the many seniors and officers who have helped me grow and mature as a leader. As a Primer, I hope to make the same difference in the lives of the Boys, by helping to mentor and grow the next generation. Most importantly, I serve because everything I do in the course of my service reminds me of God and draws me closer to Him. There is something special about service, for when we serve others, we serve God. My service involves teaching badgework programs, training the Boys for competitions, and guiding and mentoring the Y4 leaders. Z: When I was allocated to BB in Year 1, I was rather disappointed because it wasn’t my first choice. However, I still stayed on to give BB a shot and through the years, I found that BB is a really fun CCA! BB is an all-rounded CCA because it provides many opportunities to nurture our Boys, in terms of their physical fitness, leadership platforms and community involvement etc. I continued with BB in JC because firstly, I wanted to forge stronger friendships with my batch mates (most of them came back as well) and secondly, I wanted to give back to the BB with the skills and knowledge that I have learnt. 3) What would you consider the key achievements as a member of the BB? J: My main area of service was in the BB Blaze competition, an endurance race incorporating adventure elements. A typical race involves a 30km cycling leg, archery, rappelling, kayaking, micro-navigation and other miscellaneous activities, all linked with 20km of running total. My company sends in 3 teams every year and as the Head Trainer I am in charge of planning, organizing and leading in the blaze trainings. For me personally, heading the Blaze training programme was a remarkably enriching experience. I had to juggle my commitment to BB with my responsibilities as a student, which proved especially hectic in the first two terms of the year. Through it all, I learnt teamwork and communication through working with a large group of helpers. I also learnt the principles behind physical training and how to develop a schedule that was pragmatic, efficient and beneficial. I am also a leader and mentor when teaching and leading the Boys in training. In terms of aptitude, I have to be competent in the skills I teach (be fitter than the boys etc) while in terms of values I have to guide the Boys under me, modelling perseverance and reliance on God for strength. Z: There are 2 main things that I wish to highlight. Firstly, it would be the BB Blaze competition. BB Blaze is an adventure racing competition among BB companies which involves a total of 45km of long distance running, cycling and kayaking. It also encompasses various station activities such as abseiling, archery, and micro-navigation. I took part in BB Blaze when I was a Boy and now coming back as a Primer in Year 5 & 6, I helped to train my juniors and prepare them for the competition. Personally, I feel that BB Blaze is something that we hold dearly to our hearts and are very proud of because it really helps to nurture our Boys in terms of physical fitness and mental strength. Furthermore as a trainer, I think it’s even more encouraging to see my juniors outdo themselves (and their seniors) in every training and also to be able to witness their growth in character through the BB Blaze programme. Secondly, I feel that what makes us unique as an UG would be our bagpipe band. The reason for a bagpipe band is because of our Scottish roots, that we were founded in Glasgow, Scotland. There are mainly 3 instruments in a bagpipe band – the bagpipes, snare drum and bass drum. I myself play the bagpipes and I feel that it has been an amazing experience thus far. Learning to play the bagpipes has allowed me to expand my musical knowledge, especially since I do not have musical background. We are also given the opportunity to interact with other BB Boys from other companies through pipeband competitions such as the annual Pipes & Drums Festival. 4) Tell us about how you juggled your CCA commitments with schoolwork and a social life. J: For me, my closest friends are my batchmates, serving alongside me. Hence, a large part of my social life revolves around my service in the BB. Even when we’re not having CCA, I still spend most of my free time studying/hanging out with my batchmates at Raja block. In terms of schoolwork, grades have never been a big problem for me. Of course, when I’m very occupied with BB, my schoolwork inevitably suffers, for example I was really busy with Blaze training during term 1 and hence didn’t do well for my CT1s. However, we always stand down before major exams, and if you put in the effort and keep your priorities straight, the grades shouldn’t be a problem. Z: BB has been my one and only CCA for 6 years, hence it is not surprising that my closest friends in school are my BB batch mates. In fact, I am also very close to some of my BB juniors and seniors as well. As such, a large part of my social life revolves around my BB friends. Although there were occassions when I had to commit quite a significant amount of time to BB, but I believe that it does not deprive me of the time I spent with my other friends and more importantly, my family. Academics wise, generally I feel that I am able to cope with my schoolwork, despite having heavy commitments on some occasions. 5) Some would say that the Boys’ Brigade (and other uniform groups) provides unnecessary regimentation and serves no meaningful purpose in a student’s life. What are your thoughts on this? J: I think that regimentation is, to an extent, useful. It helps build discipline and camaraderie, and teaches boys to aim for excellence (for example, to aim to perfect their drill, to be punctual, etc) What is unnecessary is if regimentation is excessive for no reason other than tradition. For example, in many UGs seniors often ‘tekan’ boys by making them do lots of push ups or other forms of physical punishment. Many times, this is carried out simply because the seniors themselves went through the same thing when they were sec 1/2, and hence are merely modeling after their own seniors without thinking about the rationale and principles behind such physical punishment. Z: Unlike what many people think, regimentation does serve several purposes in teaching lessons, such as instilling punctuality and discipline in boys. It is very much similar to NS actually. In the process of doing push-ups, they also forge stronger bonds with one another because they know that these are the people who have been through the tough times with them. As seniors, we do not encourage or resort to “physical punishment” without any basis. We always ensure that we explain our rationale behind the punishment to our juniors. 6) Any advice for juniors who may be considering joining a UG or are already in the BB? J: There’s definitely a lot to look out for in a UG! UGs differ from sports in that they place much more emphasis on principles and values which will stay with you for life, rather than just a skill or sport. They are also great places to develop leadership qualities, and forge strong friendships that will last a long time. Z: To all the juniors currently in a UG, try to look beyond all the activities and consider the takeaways, be it the tangible skills or intangible values. UGs also provide many leadership opportunities and places a strong emphasis on character development, thus I strongly encourage more people to join UGs! 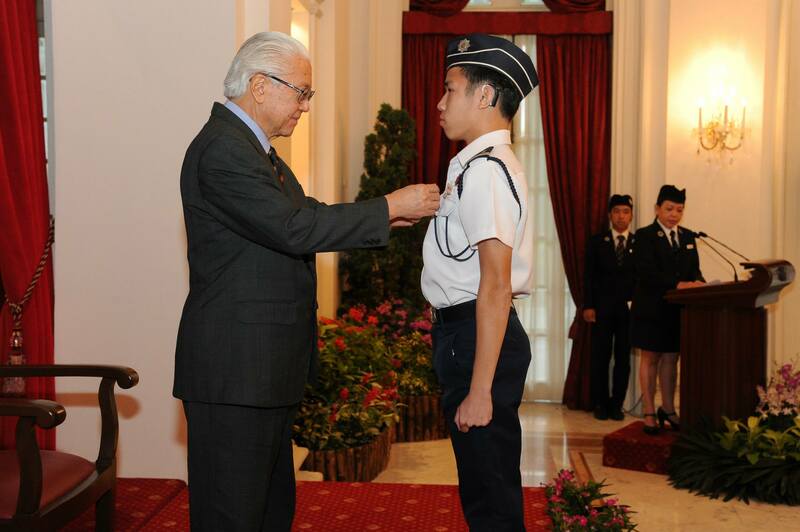 The President’s Award is the highest award that a Boys’ Brigade member can receive, this year, there were five recipients and the awards were presented at the Istana by President Tony Tan on the 16th July. 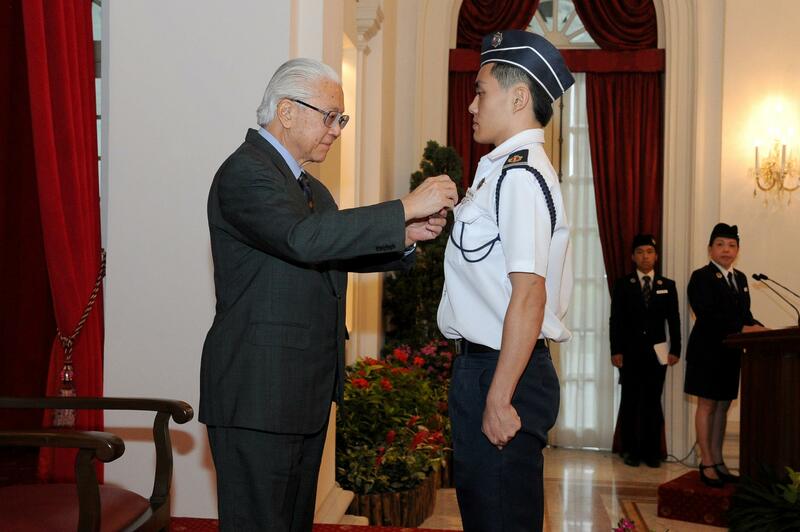 Raffles Press congratulates Josiah and Zheng Shun on this outstanding achievement.